My daughter has been interested to learn to play the piano for the past year, but unfortunately, I don’t have any musical background so I can not teach her. She already has a keyboard at home and we have been looking around for a good program she can use to help her start in her journey. Then as part of the TOS Homeschool Review Crew, we were asked to review a music and piano curriculum software from Adventus. We were more than excited to see how this would work for us! The MusicIQ HomeSchool is a multi-level music and piano curriculum software specifically designed for home learning. The software is available in different levels, from beginner to intermediate for ages 4-18 years old. Both curriculum provide lesson plans which include detailed lessons, activity sheets and assessments. You would need to have a keyboard at home. If you don’t have one, you can purchase the M-Audio KeyRig 49 MIDI piano keyboard from the vendor too. If you already have a keyboard at home, you would need to buy the MIDI to USB cable from Amazon or music stores. This is needed to connect the keyboard to the computer. Since we already have a keyboard at home, we just acquired the cable. 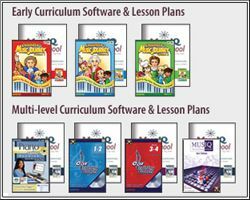 There are 2 ways to acquire the software, one is by downloading all the softwares through a very affordable monthly subscription rate of $10.95 or buying the different bundles available with the CD-ROM and lesson plans. If you want to purchase the whole software bundle and the MIDI piano, it costs $489.95 while if you want to know the price of the other bundles, check the Adventus MusIQ HomeSchool site. Since my kids are aged 6 and 9, we used the Children’s Music Journey 1 and 2 respectively. At the beginning, you would need to setup the software to ensure that the keyboard and the computer are properly connected. You would need to create the logins for your children too. Then as the children are able to login, they would be wisked away to the world of music. The journey is divided into several rooms. The first one is the lesson room where well known composers teach the lesson. The children will learn about music concepts, music theories and they will learn to play music with both hands. There is also a practice room, game room and collaboration room where they can create different music. It is very animated and interactive thus allowing my kids to stay focused on learning about music. We use this software at least twice a week and each session would last for about 25 minutes to 1 hour as the kids find it very entertaining that they usually do 2 lessons in each session. One of the best things that they like is when they are asked to create their own music. It brings out their creativity and allows them to practice all they have learned. If you want to see if MusicIQ HomeSchool is for your family, try the 7 day free trial. Also, check out what other TOS Homeschool Review Crew thinks about this music software!